Among the many gems in the library's collection is the first Masonic book printed in America. 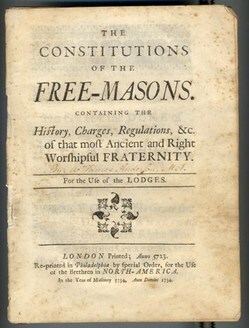 The book is called The Constitutions of the Free-Masons and was printed in June 1734 by Benjamin Franklin. Why did Franklin print this book? It seems likely that Franklin had perceived that copies of the first edition of the Constitutions (which was published in 1723 in London) were not easily available in the British colonies and, businessman that he was, he decided to print a new edition. I found this unbound copy in the Academy Bookshop in New York in 1933. It was purchased with a library in Long Island, New York, bound with other items and removed after purchased by the bookshop. It was sold to Brother Borneman of the Committee on Library of the Grand Lodge of Pennsylvania for $500. After his death it was sold at auction in the Parke-Bernet Galleries to an unknown bidder for $500. It is now rebound. On page 30 is the signature of “Lewis Evans” and on page 86 there is an unidentified word at the bottom. Several pages of the book contain circular water-marks about the size of a silver dollar. The circle is quartered by diagonal lines and in the quarters are the letters “S-P-D-S” starting at the top, reading left to right. I will briefly address the watermark mentioned above, if only to say that while this is certainly evidence of a very interesting kind (although I’ve not been able to trace which paper maker used this watermark), it does not give evidence of who owned the book, but rather who had a hand, in a way, in making the book. I'm interested in "marks in books" - those traces of evidence that tell us more about a book's past (for example, who owned a particular book before it came to reside in our library), and so I was excited to find out that, as mentioned above, our copy of Franklin's Constitutions contains the signature of a former owner of the book, Lewis Evans, as well as the date 1741. Lewis Evans was an important early mapmaker, draftsman, and geographer. He was an associate of Franklin's as well - and Franklin published the book that accompanied Evans's famous 1755 A General Map of the Middle British Colonies (another item in our collection, that we'll address in a future post). A question that I'd like to answer, but haven't yet, is why did Lewis Evans purchase Franklin’s reprint of the Constitutions? I haven't found evidence that Evans was a Freemason. Also, why did Evans obtain this book in 1741, as he presumably did, seven years after the book was published? Franklin most likely printed the Constitutions with the hope that members of various colonial Masonic lodges would buy up the edition. As late as 1750, though, Franklin was still advertising remaindered copies for sale. Did Evans buy his copy out of curiosity about Freemasonry? Or, because he was a business associate of Franklin, did Evans obtain the book at a reduced cost or possibly even receive it for free, since Franklin was clearly not having an easy time selling out the edition he printed? These are questions I don't have answers for yet. I'm hoping that, with further research, more answers may possibly come to light. Voorhis, Harold V.B. "Benjamin Franklin's Reprint of Anderson's Constitutions of 1723: The First American Masonic Book." Transactions of the Quatuor Coronati Lodge, Volume 84 (1971), pp. 69-74. Walgren, Kent Logan. Freemasonry, Anti-Masonry and IIluminism in the United States, 1734-1850: A Bibliography. Worcester, MA: American Antiquarian Society, 2003. Vol. 1, cat. no. 1, p. 3. I'm not sure exactly what you're asking, but please feel free to contact us if you have more questions about this post or the book highlighted in it. Thanks! Who & when was the 1st Masonic book published in the United Staes?